In the previous article, Maggy Fischbach’s father Albert dies in 1998 and begins sending her detailed, insightful reports of his adventures in the afterlife… including his first visit to Timestream. 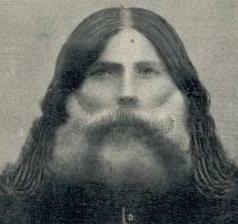 It’s his experiences within Timestream Spirit Group that are the focus of this article. Again… italicized passages indicate activity that’s happening on the other side. My comments and explanations are indented. Some of them are rather complex and detailed in this article, and while I think the information is important, it also disrupts the flow of Albert’s story. So, if you happen to be in the mood just to enjoy the flow of the story, you can ignore the indented material. Then, later, if you want to get a more intricate understanding of the situation, you can reread the entire article, comments and all. 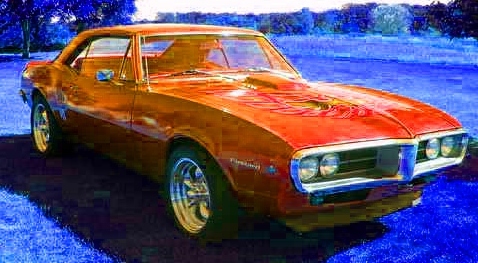 As Albert reports in the previous article, he drives his flashy, new (spirit world) Pontiac Firebird to Timestream Station, as Swejen Salter navigates. A classic Firebird, probably similar to Albert’s dream car. When they arrive at Timestream, Albert compares the spirit-world building to Luxembourg’s “Centre Conference,” or International Conference Center, which at the time (1998) is Luxembourg City’s only skyscraper (pictured below). Albert estimates that Timestream Station, though of similar height as the Conference Center, is about twice as large (width or breadth). 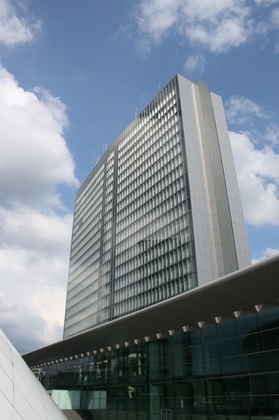 The European Parliament’s 22-story Alcide de Gasperi building was built in the early 1960s in Luxembourg’s Kirchberg district. Albert Fischbach said Timestream Station is about that tall, but twice as large. Albert accompanies Swejen into Timestream through a large glass door. The lobby is immersed in a strangely pleasant, light-blue luminescence. Young men and women in white overalls hurry about and carry strange objects. Swejen chats with some of them and introduces Albert, who notices they’re all friendly, and they all seem to know his daughter Maggy, the main ITC researcher on Earth who’s in regular contact with Timestream. 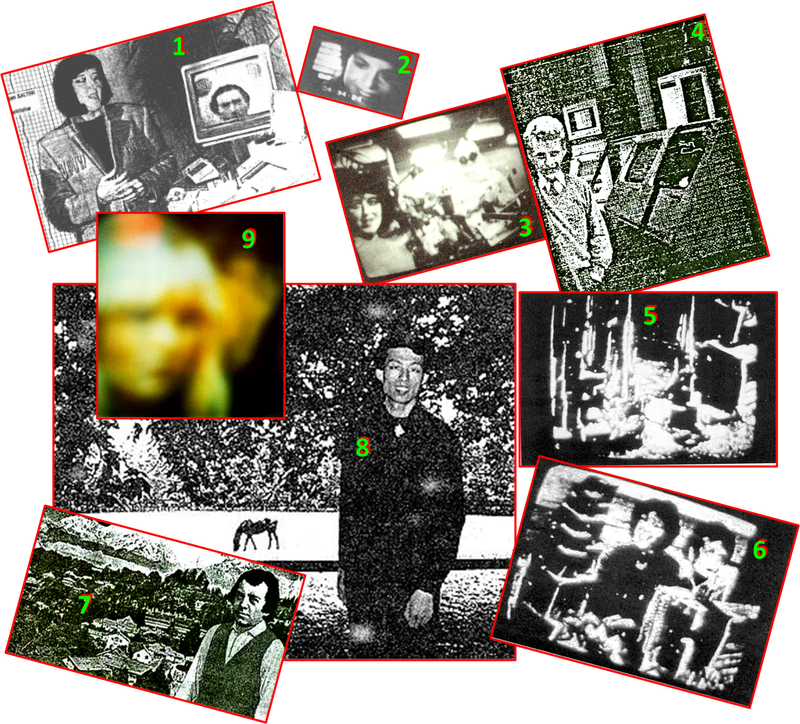 9) The higher being Nsitden, one of The Seven “Rainbow People” who facilitated the ITC bridge between Timestream and our INIT group, which included Maggy Fischbach. Swejen then accompanies Albert into the Hall of Records, one of the many rooms at Timestream. I get a sense that the Timestream Station is assembled to LOOK LIKE a material building on Earth, although it’s something a lot more complicated than that. Two probable reasons why it APPEARS to be an earth-like building are 1) because the residents of the Third Level are still accustomed to earthly things like buildings, and 2) Timestream’s main mission is to deliver spirit-world information to us humans on Earth, and that information has to be something we can relate to. So Timestream Station is set up to LOOK LIKE a building on Earth to meet the expectations of humans on Earth and on the Third Level. I suspect that Timestream Station could more accurately be described (using modern terminology) as an elaborate collection of hyperlinks embedded in the virtual structure of a building. I know from other sources that there is a Hall of Records or akashic library on the Third Level… and I’m fairly certain that it’s not a “room in a Timestream building” the way the kitchen is “a room in your home.” The Hall of Records has always been there on the Third Level, and Timestream is a relatively recent addition (in terms of earthly time). Timestream was probably ‘constructed’ so that people on the Third Level, while pursuing their main mission of establishing communication bridges with researchers on Earth, could also have access to a lot of other, related services and resources. The upper floors of Timestream Station, for example, are “dispassing points” through which beings from the Fourth and Fifth Levels and higher can come to Timestream to participate in the ITC projects. So it would make sense that one of the “rooms” on a lower floor of Timestream is actually a hyperlink or virtual doorway that opens into the Hall of Akashic Records. As Albert enters the Hall of Records, he notices light beams streaming down like spotlights from an unknown source (no bulbs or light fixtures). The beams don’t spread out like they do from a floodlight on Earth. They do just the opposite. They seem to start out wide from the source above and narrow down to a tighter focus to shine directly on Albert (and, presumably, on Swejen and on anyone else who happens to be in the hall). The hall is filled not just with books and papers but also with a lot of technical equipment and strange apparatuses, including what look like massive computer terminals (see #4 in the collage). Thousands of little lights are flashing on the many apparatuses. A man emerges from a corner into the light, and Albert is amazed to see Father Antoine, the esteemed leader of a spiritual movement that Albert and his mom were involved with when Albert was just a boy. (Read more about Antoinism…) Albert feels the same awe he felt as a child. And while most people here on the Third Level have no blemishes or facial hair, Father Antoine still has the thick, white beard that was his trademark in lifetime. “Father Antoine! You! Here!” Albert exclaims. Albert gazes into what looks like a large crystal egg and sees a man with a big fur coat and heavy gold chain around his neck, standing before a high desk with a pen in his hand, writing figures in a big book. Suddenly Albert knows he IS that man, a 15th Century German banker (fugger). His name is Caspar Lindfeldt, and he has a wife and six children. 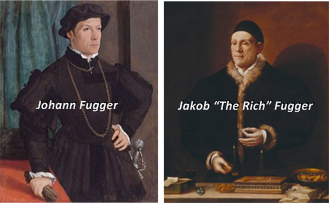 He is a close friend of a man named Franz von Schafheitlin, who is also a fugger. Albert watches as the life of Caspar Lindfeldt (HIS life) unfolds before him. 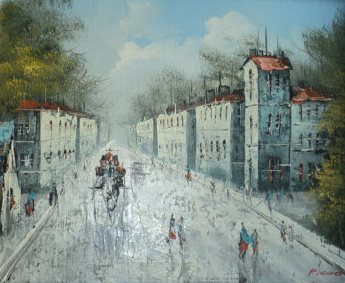 He sees himself driving a carriage through a city of 15th-Century houses. If the “fifth body” is the physical body, then the “fourth body” is probably the rejuvenated astral body that Albert (and other Third Level residents) acquire after they die. The astral body is less changeable than the physical body. It doesn’t age, doesn’t succumb to sickness, and it quickly returns to normal (or “heals”) when injured. So presumably it is “less illusory” than the carnal body. As we move inward to the third, second, and first body, I suspect that more and more illusion is stripped away, as we move toward perfect reality and oneness… which is what I call “the soul.” This numbering system is at odds with the “spirit worlds” numbering system of Frederic Myers. (Read more…) The “fifth body” (carnal body) flourishes on the First Level (material world, or Earth), and what is presumably the “fourth body” (astral body) exists on the Third Level (mid-astral realm). So that mismatching is something we’ll have to map or consolidate into a better overall model one day, as we learn more of these bodies and levels. For now the best we can do is take the word of experts such as Father Antoine and Frederic Myers, and try to come up with some sense of order and understanding. This entry was posted in Uncategorized and tagged afterlife, Albert Fischbach, Life on the other side, timestream. Bookmark the permalink. This is terrific! I enjoy every bit of these, and I think I speak for many others when I say that I am thankful for this wealth of wonderful information that you continue to post! that I hope to have someday as well!! Thank you Mark, for your obviously abundant efforts & amazing dedication, which makes all of this life changing information available to the world! This whole site is truly a gift!! Thanks Diana! You’ve made my day. I’ve been following your post and this one of the best and for me complete package on spirit word description and activities…Thank You very much for your dedication. Hi Nestor, I’m glad that you like these latest posts. I too think this is very insightful information that Timestream sent to Maggy after her father died. many years ! Do you think that the voices that get through use their own equipment ? What I am trying to say is I don’t think they use Timestream,or any other group ! My main answer is, I don’t know… although I can speculate. On one hand, it makes sense to me that a lot of EVP voices come from people in spirit who didn’t get to the Third Level… they’re in the ‘shadow world’ of spiritual residue that blankets the Earth. I think that’s where most poltergeist activity happens. If most EVP contacts come from there (that dismal realm or lower astral plane), then there’s probably not a lot of organization on the spirit side involved in EVP efforts, as we see in the Timestream contacts. It’s more random. On the other hand, I know that since Konstantin Raudive died and got settled in at Timestream, he’s made a dedicated effort to contact lots of EVP researchers around the world. That fact opens up the possibility (in my mind, at least) that Timestream might be monitoring and working with a LOT of EVP researchers and, best case scenario, might be ramping up for some really major breakthroughs in the coming years. That’s certainly my hope… that a lot of good-hearted experimenters will start getting enhanced ITC contacts from Timestream and other spirit groups before too long. But the bottom line, still, is that I don’t really know. love to call up a loved one who has made their transition ! Who knows in the future! Anyway thanks for replying ,and keep up the good work . Hi Mark, really enjoyed reading this and was stuck by the almost exact same description given by out of body experiencer Jurgen Ziewe. Wendy Zammit. Yes, I suspect that many of us visit that afterlife paradise (probably at “level 3”? ), whether in dreams, NDEs, channeling sessions, (and of course after we die)… so I suspect there’s bound to be some familiarity and similarity in our experiences. At the same time these experiences can be so profound and life-changing to our carnal body-minds that they seem deeply personal and unique.